She is also known in the Cosmic Cowgirls community as the Bejeweled Baroness and Glitter W.A.S.P. Elizabeth leads her students on vision quests and creative adventures utilizing universal sacred symbols and archetypes and the Jungian process of “active imagination”. 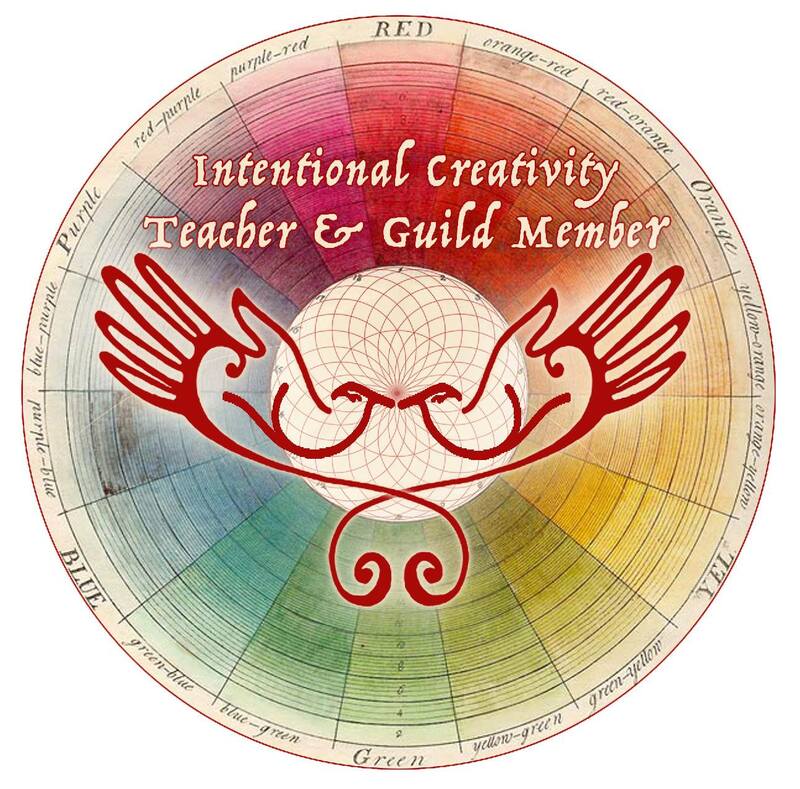 Elizabeth is a Certified teacher of Intentional Creativity, a method created by Sue Hoya Sellars and Shiloh Sophia McCloud Lewis. These guided visualizations and meditations are a tool for witnessing deep inner wisdom that lies buried in each person’s psyche. With Elizabeth’s unique talent for guiding a journey that is fun, relaxing, mystical and enchanted each student is then able to release blocked energies and old stories and step into a more expansive and open way of being the powerful creator of her own life. We all live our lives and create our reality bubble based on stories that we tell ourselves about who we are. Often these stories are running us without our conscious knowledge or choice. We are reacting and feel powerless to shape our own existence. Bringing these stories into our awareness is the 1st step in becoming a powerful creator who makes joyful choices that are soul sustaining. As a teacher, she encourages her students to explore materials that awaken their sense of wonder, joy and playfulness. 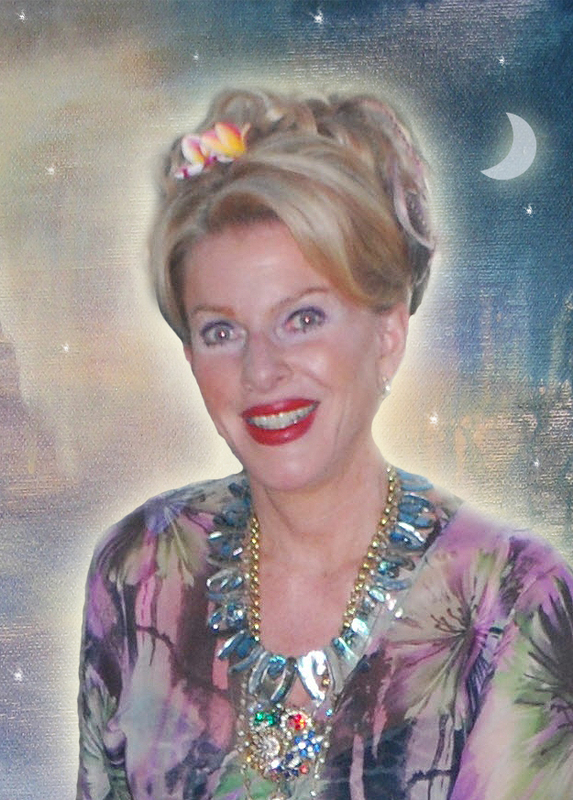 The tools of the Cosmic Guidance system that Elizabeth offers include sacred symbols, archetypes and playing with the sparkle of glitter, beads and jewels. Students are supported and inspired to reconnect with the language of their souls and ignite the divine spark that Elizabeth calls their SOUL-SHINE. As they raise their vibrations, the alchemy of healing that is part of their natural capacity, is activated. Elizabeth resides in San Francisco at the Palace of the Soul with her fabulously talented children and her revolving “extended family”. Here she runs The Divine School of Glitteracy where she guides women and girls on magical adventures and ceremonies that allow them to reinvent their lives to align with more creativity, joy, enchantment, expansion, beauty and love. Elizabeth gained her first degree, a B.A. in psychology at Vassar College where she also studied philosophy, religion and art history. She then attained a Master’s Degree in psychiatric social work, working in the state mental hospital, with chronic schizophrenics, amputees and cancer patients, running group therapy and individual therapy. Her experience with these modalities of healing left her disillusioned and drained. She left the field of social work and embarked upon a quest to discover more empowering, humane and creative methodologies of healing. She became a world traveler who studied the spiritual traditions of many cultures. She eventually met and studied with Shiloh Sophia McCloud and completed her certification as an Intentional Creativity Teacher, a method developed by Shiloh and Sue Hoya Sellars..She also completed a course with Christie Marie Sheldon, renowned energy healer, as an INTUITIVE LIFE COACH. 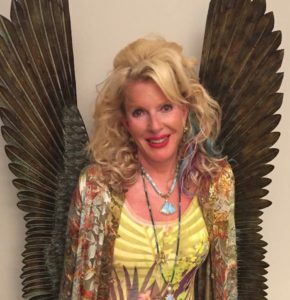 She went on to develop her own unique way of teaching that blends mysticism, psychology, spirituality and energy work into a transformative form of expressive art and creativity that she calls “Glitteracy”. The art of Elizabeth Gibbons is created by connecting to the Divine and receiving messages that will help harmonize and connect viewers more deeply with their sacred core and their soul. It is a fusion of spirit into matter and is infused with the intention of healing. 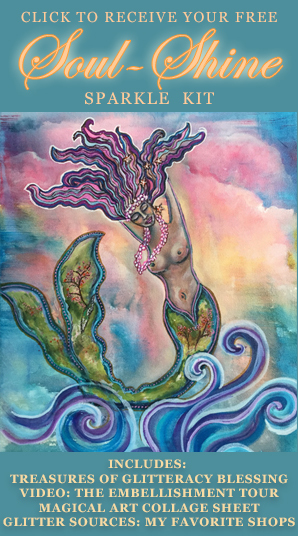 Her art celebrates the power and beauty of the Divine Feminine. My commitment to you and your loved ones is to continue to bring you cultural events, playshops, art images, art exhibitions, music, inspiring practices and writings that help you to reconnect with your sacred core and that awaken the power and magic of your soul. I am growing and continuing to create offerings at the Palace of the Soul in San Francisco that nurture your soul, awaken your divine light and connect you to a community of people that are walking the soulful path of truth, beauty, creativity, love and healing together. To get started, please download my Soul Shine Sparkle Kit using the box to the upper right of this page.